Hi loves! Today I have some more great HARE polishes for you, this is a trio of flakie toppers called Rise & Shine. Nikole originally cooked this up just for her but luckily for us she released them to the public :-). These are all very delicate and pretty and can be layered over a lot of different base colors. 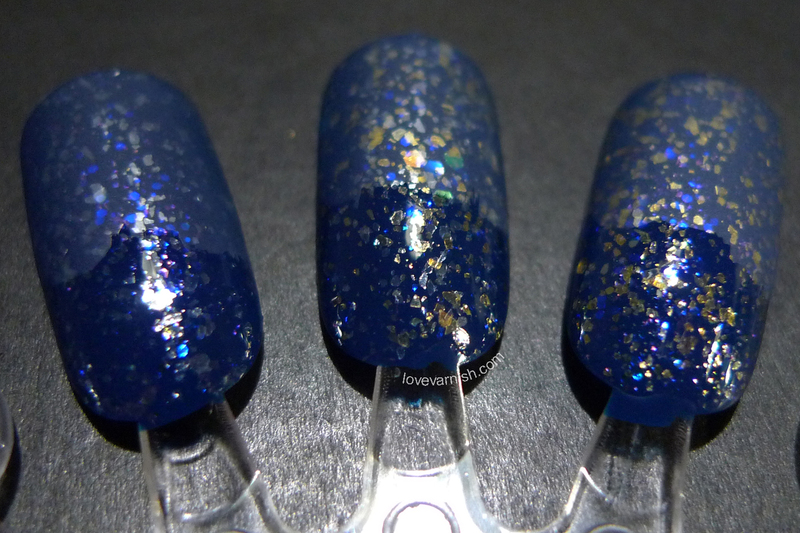 Application and formula was the same for all 3 - 2 coats over Bondi Midnight Mystery. It applied like a dream, only thing you have to do is let the first coat dry properly, but that's always the case with flakies and glitters. There isn't anything sticking out or up and with a topcoat it looks smooth and shiny! HARE Rise is a silvery white flakie top coat accented with purple/blue shifting iridescent glitter. 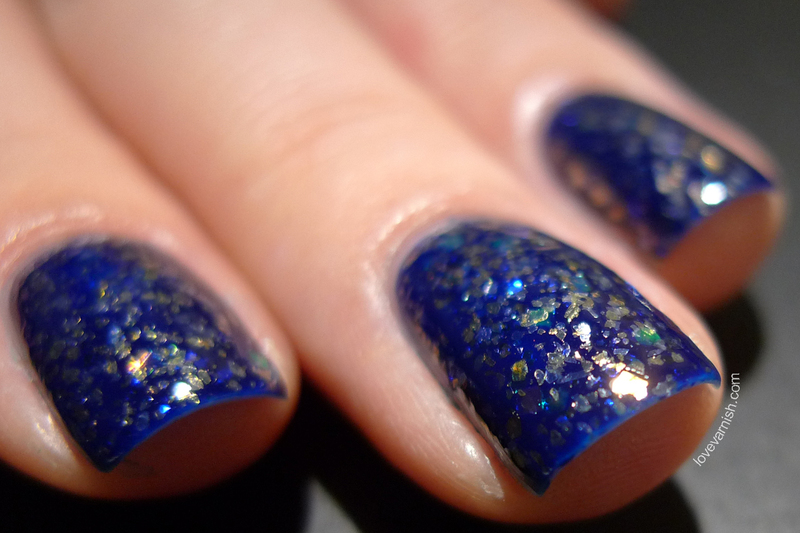 Aaah, that iridescent glitter ♥. HARE & (Ampersand) is a mix of (predominately) gold flakies, silvery white flakies, with a mesmerizing mix of iridescent rainbow shifting glitter in several different shapes and sizes. It's such a mermaid like polish! 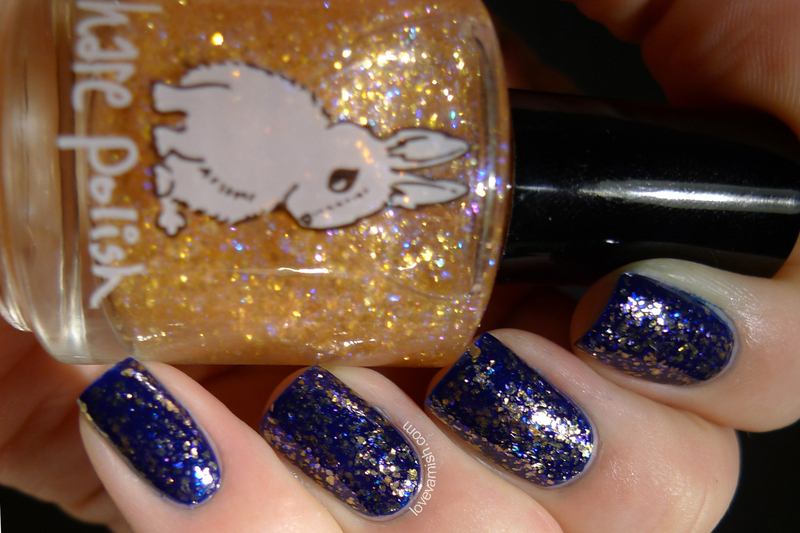 HARE Shine is a golden flakie top coat accented with purple/blue shifting iridescent glitter. The golden counterpart to Rise and another stunner. Which one of these is your favorite? And what color would you layer them over? Tell me in the comments! This are really nice!! Love the blue you paired them with. I'm obsessed with this! So stunning! AMAZING swatches! I love them over blue! It really shows the difference between each of them. Lovely. Aww thank you! That means a lot as I actually wasn't completely happy with them ♥. The 2 coats were inspired by you :). This is amazing!!! I really love this two-toned stamping.